Some of the hardest cases that I work on involve anxiety and fear. There are many things that can cause an extreme reaction and the Thundershirt has a wide variety of situations that it is helpful in. During the time of the summer fireworks are a common source of anxiety for dogs. It’s no wonder, because the loud noises are random and startling. I am thankful I live in the middle of town where it is not legal to set off fireworks. 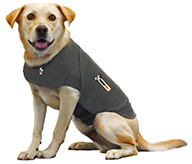 Using the Thundershirt allows the dog to calm down so that learning can take place. Along with the shirt, implementing a training program that gradually increases the intensity of the stimulus while pairing it with something the dog enjoys. For example: Using a recording of fireworks or other loud noises, you can turn down the volume and every time the noise happens the dog receives a piece of steak. Gradually the volume is raised as the dog gets comfortable with the noise. After some work the dog will associate loud noises with steak and not have such a strong fearful reaction. This sounds very simple when you write it down but some cases can be more complicated and if you don’t have success consulting a positive trainer can help you and your dog figure out the best behavior modification plan. 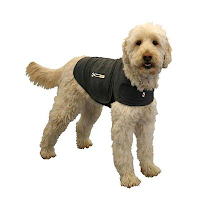 Visit the Thundershirt website for more information on how it can be used to solve a variety of behavioral issues. · TTouch dog trainers use pressure to address a wide variety of anxieties. · Veterinarians use pressure to relax cattle when they are administering vaccinations. · People with autism use pressure to relieve their persistent anxiety. · Children with certain behavioral problems use pressure shirts and weighted vests to relax and focus. · Parents use swaddling to calm an inconsolable newborn infant. 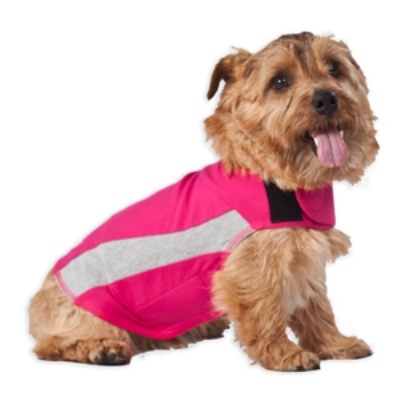 These videos show what great results can be achieved with the Thundershirt. I just found your blog and you handle some important topics. Nice job. Thanks, Sue! I'm glad you found my blog and hope you'll enjoy reading future posts.